Introducing the core team bringing you the NZ Mega 2020 event. The team is made up of 3 dedicated individuals, each with a passion for geocaching and for the New Zealand geocaching community. It all started for Ron on Saturday 29 October 2005 while visiting the sleepy little town of Las Vegas, Nevada. His good buddy, Commander Eldridge, explained the basic concept, then said, "And sometimes there is one hidden right here" as he leaned over and grabbed a geocache right off the New York, New York Casino's replica of the Brooklyn Bridge. That's all it took to get him hooked for life. 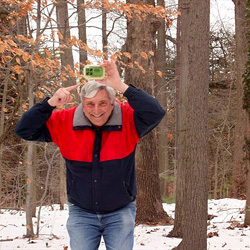 On his return to Virginia, Ron continued geocaching. There was an active caching community there which helped him along. He sometimes also travelled for work, so was able to get out in his spare time to grab cache finds in several places around the US. When he retired in 2014, he returned to New Zealand and became a full-time geocacher. He has a geo-van in which he sleeps when he takes caching trips either locally or to distant mega events around the country. Ron now has over 10000 finds and has completed both the Cache Across America and Cache Across New Zealand series - the only cacher to have done both. He likes to use Perl programs to solve difficult puzzles that have lots of combinations, and has led several CITOs getting support from local businesses. Ron has experience leading school galas and running large raffles for fundraising. This should come in handy planning the 2020 event. 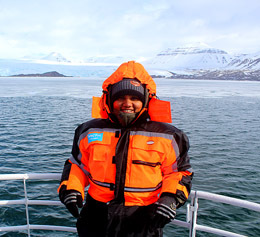 Between them they have finds in 14 countries, mostly due to Harsha's curiosity and passion for travel, including some amazing adventures in far away and exotic locations as Svalbard, where Harsha travelled with Chris in 2018. HariSree's longest caching streak is 585 days, and they have totalled over 2600 finds so far, including some very memorable finds along the way. Harsha's favourites include tree climbing caches and spectacular locations such as an earthcache in Tonga about a boulder the size of a double storey building that was moved by an ancient tsunami - discovering places like this is what keeps her going! Harsha has been an event service professional for the past 12 years and is excited to be a part of the NZ Mega 2020 team. She is looking forward to welcoming you all to Auckland! Chris started geocaching back in 2007, when he was planning to spend some time overseas, and it seemed like a great way to explore while travelling. Of course, he was bitten by the geocaching bug and the rest is history - we all know how that goes, right! 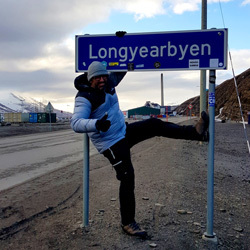 12 years later, he is still going strong having found over 11000 geocaches, and with travel being a huge passion that compliments geocaching nicely, he has found them in around 80 different countries, on every continent except Antarctica (but he has plans for that one too!) When not travelling (and also a little bit while travelling) he partakes in a bit of FTF hunting, with a tally of around 2400 to date. Highlights of his caching career include finding geocaches in the northern most settlement in the world, under 24 hour sunlight in Svalbard with harisree, while keeping an eye out for polar bears, completing an earthcache on the crater rim of a live erupting volcano in Vanuatu, visiting both of the remaining Project A.P.E. caches - one in the Brazilian jungle and the other in the mountains near Seattle, an impromptu caching expedition with the staff of Grounsdspeak during Block Party 2013, and a 34 country geocaching roadtrip with best mate and fellow geocacher, slieschke. And so many more memorable moments! Also an avid geocache hider, Chris has over 550 listings including 3 that have been awarded "Geocache of the Week" by Groundspeak's Blog. He is also proudly a key member of the team that organised the well received Auckland 2013 mega event.